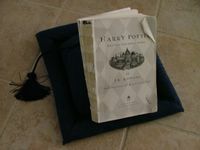 Our copy of Harry Potter and the Sorceror's Stone, cover gone, taped spine, well thumbed pages...loved. We just finished listening to the audiobook of Harry Potter and the Sorceror's Stone. Unlike my daughters I have not reread the series multiple times but with book 6 soon to arrive, it seemed like a good opportunity to review. Listening to Jim Dale bringing the character and stories to life is M-A-G-I-C-A-L. I have been struck by Rowling's wonderful descriptions, character names and humor. Dale is a brilliant narrator. He gives different voicings to the characters but it is never forced or artificial sounding. I can hardly wait to listen to the next one. Janis Campbell at FortWayne.com has an interview with Jim Dale. The audiobook of The Half Blood Prince will be available on July 16 along with the hardcover. It is an excellent interview. Dale describes how he works and the secrecy surrounding the next book. He did it 100 pages at a time. Because the audiobook has to hit stores when the book is released, Dale had to record the book in a hurry back in April. Dale says he got the book to start reading over a weekend, and on Monday he recorded the first 100 pages. On Monday night, after leaving the studio, he read the next 100 pages and practiced the voices or invented new ones if the section he was working on had new characters. On Tuesday, he was back in the studio, working on the next big section of the book. Dale said he didn't have time to read the book through before he started recording it, so it was fun each day to see how the story was unfolding. Dale says most days he was in the studio from 9:30 a.m. until 4 or 4:30 p.m., or "as long as my voice held out." As a trained actor, Dale knows how to take care of his voice. One of his tricks for soothing this throat is tea with honey. Dale even raises his own bees at his second home to make honey, which he enjoys, and gives as gifts to friends. I LOVE Jim Dale. He really is amazing--a perfect fit for Rowling's characters and humor. "Goblet of Fire" is his real masterpiece. Wait until you get to it! I used to clean listening to this one :) "Order of the Phoenix seemed a bit rushed, but then again, so did the book.